Rajasthan Public Service Commission has recently published various employment advertisement. Now the RPSC Recruitment 2018 Notification is released for filling up 169 ASF & Forest Range officer. Candidates who wish to apply can fill up an Application form from 27.04.2018. You can apply online for Rajasthan PSC ASF Jobs either from here or official site. The last date of online registration is 16.05.2018. Furthermore, information applicants must check RPSC Vacancy 2018 Advt. through given below links. So read our article carefully to get the latest update. Rajasthan PSC is inviting an online application form for 169 Vacancy of Forest Range Officer & ASF Post. It is a golden opportunity for candidates who are seeking a government job. Participants must read this article carefully for details of RPSC Recruitment 2018. Here we provided you links through which you can easily download Rajasthan PSC Vacancy 2018.Applicants fill up their application forms without waiting for the last date for RPSC ASF Jobs 2018. Fresh Update as on 17.04.2018 : RPSC Assistant Statistical Officer Vacancy online form is available from today. Applicants who are interested in Rajasthan PSC ASO Recruitment can fill online form here. Here in below section we also provide you online link. Participants who do not found eligible for RPSC Recruitment 2018 their form will be rejected. So, Candidates must read this section to know about age Limit, Pay scale and Qualification. Here we provided you links to apply online for Rajasthan PSC Vacancy 2018. Applicants may also download RPSC ASF & Forest Range Officer Recruitment 2018 either from links given here or from the official website. Candidates who applied for RPSC Jobs 2018 must hold Degree with at least one of the subjects Physic, Chemistry, Computer application and Zoology, etc. Participants must consult Official Notification of RPSC ASF & Forest Range Officer Vacancy 2018. Applicants must complete 18 years of age and should not more than 40 years for RPSC Recruitment 2018. Here we provided you brief details about Rajasthan PSC Jobs 2018. Candidates must prepare strongly for RPSC ASF Vacancy 2018 Examination. Participants may also visit Official Website of Rajasthan PSC Recruitment 2018 for further more details. for age relaxation list applicants should download RPSC Notification 2018. Salary Package is decided by Rajasthan Forest Department that is based on Pay Matrix L-14 and Pay Matrix L11. Candidates should put efforts to grab good marks in RPSC Recruitment 2018 Examination. Applicants may download Official Notification of RPSC ASF Jobs 2018 from links provided here. Participants should be selected on the basis of two stages Written Exam and Interview for RPSC Recruitment 2018. Applicants need to select two optional subjects from given subjects. Candidates should face four papers – two compulsory and two Optional for Rajasthan PSC Recruitment 2018. For an Optional Subject list, Applicants must consult Official Notification of RPSC Bharti 2018. Each Paper Contain 100 Marks. Duration of Each Paper is 3 hours for RPSC Jobs 2018. Participants may also download RPSC Notification 2018 either from this page or from the official website. Application Fee details do not mention in Official Notification RPSC Recruitment 2018. 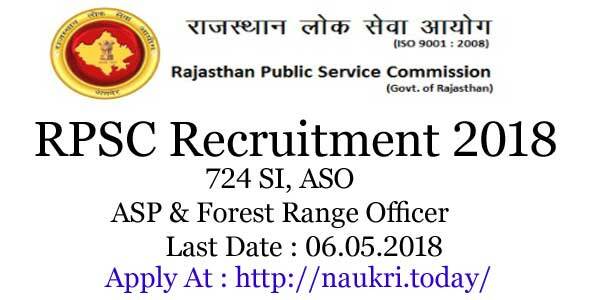 So Candidates can apply from here for Rajasthan PSC ASF & Forest Range Officer Vacancy 2018. Applicants should read this article carefully before applying for RPSC Bharti 2018. Participants must check notification for furthermore details about RPSC ASF Jobs 2018. Participants should check here easy steps which help you to apply Online for RPSC Vacancy 2018. Applicants can apply for Rajasthan PSC Jobs 2018 through Online mode. Candidates must check RPSC ASF Vacancy 2018 Notification at official Website. Firstly, Candidates should log on to the official website of RPSC Recruitment 2018 i.e. rpsc.rajasthan.gov.in. Are you want to job in police department??? If yes then here is a golden opportunity for you. राजस्थान लोक सेवा आयोग RPSC Recruitment 2018 Notification announce for filling up 330 Sub Inspector (उप निरीक्षक) vacancies. Interested and eligible candidates can fill Rajasthan PSC Online Form either here or official site. The online registration of RPSC SI Jobs will start from 25.04.2018. Applicants who are desired to apply fill application form till last date 24.05.2018. Furthermore, information regarding RPSC Vacancy is mention in below section. Rajasthan Public Service Commission has recently published employment advertisement for filling up 330 SI Vacancies. This is a good opportunity for that candidate who wants to make a career in Rajasthan Police. RPSC Sub Inspector Jobs online form is an available official site or also available here. Rajasthan PSC Jobs more information such as eligibility criteria, application fees, selection process and others are mention in below section. Aspirants who are interested in Rajasthan PSC Sub Inspector Jobs must ensure that they are eligible or not. The eligibility criteria for RPSC SI Vacancy is mention in below section. Before applying all applicants should check their educational qualification, age limit, physical standards and others. Candidates should have Degree in any stream from recognized university. For RPSC Recruitment applicants also have a working knowledge of Hindi in Devnagari Script and knowledge of Rajasthani Culture. Furthermore, information checks Rajasthan PSC Bharti Notification for Sub Inspector post. The age criteria are based on 01.01.2017. The minimum age is required for RPSC Jobs is 20 years. Candidates should not be more than 25 years. Now the department is relaxed all category candidates in Upper age limit as 03 years. Other categories wise age relaxation is also applicable as per govt. norms. Applicants who want to fill RPSC Recruitment 2018 online form must submit require application fees. As per the previous notification, General candidates have to pay Rs. 250/-. OBC (Creamy Layer) candidate need to pay Rs. 150/-. While SC/ST PWD candidate requires paying Rs. 50/-. Furthermore check Rajasthan PSC Notification carefully. Participants who are selected for Rajasthan PSC Sub Inspector Vacancy will get a monthly salary by department. The running pay band for RPSC Recruitment is Rs. 9300/- to Rs. 34800/- with grade pay Rs. 4200/-. For more information check official advertisement. Applicant will select according to their performance in competitive exam, Physical Standard Test and then interview. For RPSC SI Vacancy first written test conduct by organizers. Then qualified candidates will call for physical test and after then interview organized for quality candidates. More information check Rajasthan PSC Bharti Notification. 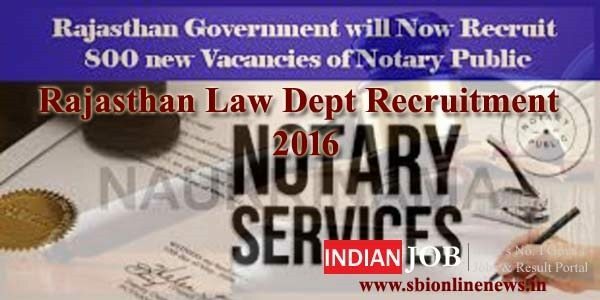 Applicants who want to apply for RPSC Sub Inspector Jobs can apply through online mode either here or official site. Before going to apply online for RPSC Vacancy candidates must have valid email id, mobile no & scan copy of photo & signature. The instructions to apply online for Rajasthan PSC Recruitment is given on below section. First of all, go to official site www.rpsc.rajasthan.gov.in. Go to Download Rajasthan RPSC SI Bharti advertisement. You require reading the full notification carefully. Then log on to so portal sso.rajasthan.gov.in. If you are a new user, first register on it and then apply for RPSC Recruitment. Fill Rajasthan PSC Vacancy Application Form correctly. Submit you RPSC Sub Inspector Recruitment 2018 Application Form. Then take print out for future uses. Conclusion : Rajasthan Public Service Commission has recently announced recruitment of 330 Sub Inspector Posts. RPSC Recruitment 2018 for 330 Si jobs online form available official site as well as here. The online application form of RPSC SI Jobs will start from 25.04.2018. The Last date of apply online is 24.05.2018. Do you have Degree in Statistics? Are you searching RPSC Recruitment 2018 ??? If yes, then here is the latest news for you. Rajasthan Public Service Commission (RPSC) has recently published an advertisement for filling up 225 Assistant Statistical Officer (सहायक सांख्यिकी अधिकारी) Vacancy. RPSC Recruitment 2018 online for starts at 17.04.2018. Interested and eligible candidates may apply through online mode for RPSC Assistant Statistical Officer Jobs. The last date for submitting Rajasthan PSC Vacancy application form is 06.05.2018. Furthermore of information mention on below section. Rajasthan Public Service Commission is inviting online application for 225 ASO Vacancies. This RPSC Vacancy is release for TSP & Non-TSP Area. Rajasthan PSC Online Form of Assistant Statistical Officer job is available here. You can fill your RPSC ASO Jobs Application form either here or official site. Furthermore, information of Rajasthan RPSC Jobs is mention below. Before apply online should read eligibility criteria, application fees, selection procedure, how to apply & others. Rajasthan Public Service Commission decides eligibility conditions for RPSC ASO Recruitment. Candidates who are interested must ensure that they are eligible or not Rajasthan PSC ASO jobs. It comprises information of educational qualification, age limit, experience and others. Furthermore, you require reading given section. Candidates must have a Second class master degree in Mathematics, Statistics, Economics & Commerce. Or they should have one-year diploma in statistics from a recognized university. For RPSC ASO Recruitment application also require Computer diploma or degree. List of diploma or degree is mention below. For Rajasthan PSC ASO Vacancy the minimum age is required 18 years. Applicants should not be more than 40 years as on 01.01.2019. Upper age relaxation is also applicable for RPSC ASO Recruitment 2018. The details of age relaxation in years is given below. After selection of the candidates for Rajasthan Public Service Commission ASO Jobs, they will receive a monthly salary. The RPSC ASO Bharti monthly salary will make on the basis of Pay matrix l-11. Furthermore, you may refer to Rajasthan PSC Recruitment Notification. Yet the department not issued the application fees on the recent notification. The RPSC ASO Job application fees for all categories should be notified very soon here. Furthermore, information checks RPSC Notification 2018 carefully. The department will get conduct written examination for RPSC ASO Bharti (सहायक सांख्यिकी अधिकारी भर्ती ). All appliers who successfully fill online form must require qualifying the RPSC Assistant Statistical Officer Bharti examination. In an examination, there will be 100 multiple choice objective questions. The duration of examination will be 02 hours. More details check RPSC ASO Exam Syllabus 2018 from here. Applicants who want to desire to apply for RPSC Assistant Statistical Officer Job may apply through online mode. The online registration form is available very soon. Candidates can fill RPSC Recruitment Online form either here or official site. Before going to fill the application form you must have valid mobile no., email id and scan copy of require documents. Rajasthan RPSC ASO Job online registration process is given as under. Firstly all applications go to official site rpsc.rajasthan.gov.in. Download Rajasthan PSC Assistant Statistical Officer Job Notification. Read it properly, all information is mention on this. Then go to Rajasthan SSC portal to apply for RPSC ASO Recruitment. Select State Recruitment Portal Service. If you are not registered in SSO portal, then first you must register. After that login in SSO Portal and then go to apply for RPSC Assistant Statistical Officer Recruitment. Uploads signature & photograph on your RPSC Recruitment Application form. Submit your RPSC Online Form for Assistant Statistical Officer vacancy. You can directly apply online to click on given below link. Conclusion : Rajasthan Public Service Commission has released employment advertisement for recruitment of 225 Assistant Statistical Officer jobs. Candidates can fill RPSC ASO Recruitment Online form either here or official portal. The last date of Rajasthan RPSC Recruitment is 06.05.2018.